Do you have a dad in your life who chose to be a special dad even though he didn't need to be? This makes a great gift for the step dad or step father any day, or on a special day like your wedding day. 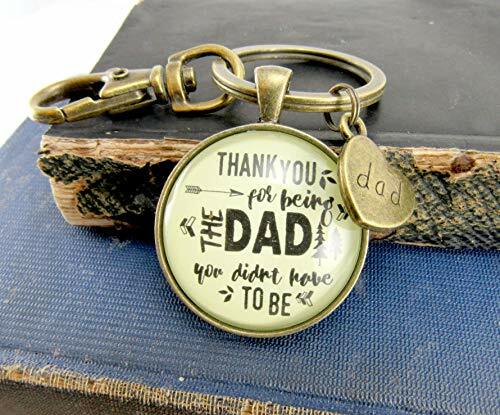 This glass pendant key chain, which includes a zinc alloy bronze-colored Dad heart charm, is a distinctive piece of step dad or step father jewelry designed by Gutsy Goodness. "I feel so blessed to have you as my dad. Life's circumstances could have led us to have a relationship that was 'fine.' But wow. You have given me so much more more! You have shared a part of yourself with me. You have been what a dad is--loving, supportive, concerned and always willing to listen. Thank you for being so much more and giving me a relationship I treasure." Color: Antique cream colored background of fathers quotation and image.